The shooting for the film is going on in full swing at Ramoji Film city since with Rajinikanth and it will go on till evening. The shooting for the film is going on in full swing at Ramoji Film city since this morning with Rajinikanth and it will go on till evening. The 63-year-old actor looked fresh and fit in a get-up of a young man while shooting scenes for the movie. 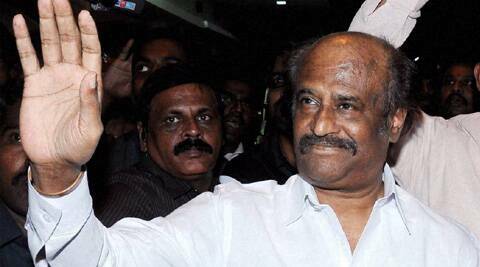 Post the release of ‘Kochadaiiyaan’ Superstar Rajinikanth is busy shooting for his next film ‘Lingaa’ at Ramoji Film city in Hyderabad. The ‘mahurat’ shot of the movie was shot in May this year at Chamundeshwari Temple in Mysore. Apparently, the film has been named after Rajinikanth’s grandson Linga, who is the son of actor Dhanush and Rajinikanth’s elder daughter Aishwaryaa R Dhanush. After romancing Aishwarya Rai Bachchan in ‘Robot’ and Deepika Padukone in ‘Kochadaiiyaan’, the superstar will be seen opposite Sonakshi Sinha in ‘Lingaa’. The film spans across generations and has music by A R Rahman. ‘Lingaa’ is being directed by K S Ravikumar. The film features Rajinikanth, Anushka Shetty and Sonakshi Sinha in lead roles.